Maybe "festival" is too strong a word. But you have to start somewhere. The town of Karval will host its Third Annual Mountain Plover Festival, April 24-26. This year's event adds new bird watching sites, a photography contest, and an extra day of activities including a Friday night stargazing trip. Karval is a farming hamlet, population "about 35," in southern Lincoln County. Registration deadline is April 15. 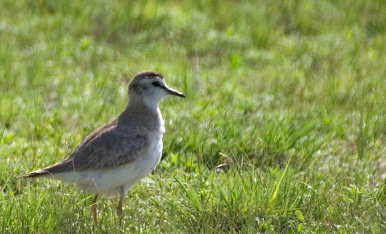 Despite their name, mountain plovers do not breed in the mountains, instead, they prefer shortgrass prairies. The eastern plains of Colorado are the primary breeding grounds for the mountain plover and more than half of the world's population nests in the state. Mountain plovers, are a considered a species of "special concern" in Colorado because of declining numbers. "The Mountain Plover Festival is a great way for people to experience the small town atmosphere of a rural community while watching birds and learning about the culture and history of Colorado's eastern plains," said John Koshak, a watchable wildlife coordinator with the Colorado Division of Wildlife. I once thought that some kind of corner in becoming rooted in place would be turned when we started having festivals more rooted in natural cycles. And I don't care if someone at the Chamber of Commerce came up with the idea (see, for instance, Pueblo's Chile & Frijoles Festival) -- the message is bigger than that. First came the Monte Vista Crane Festival, followed by Lamar's Goose Festival. It's a trend, and a good one. Mountain plover photo courtesy of the Colorado Division of Wildlife.